The shiitake (Lentinula Edodes) is also commonly called "sawtooth oak mushroom", "black forest mushroom", "black mushroom", "golden oak mushroom", or "oakwood mushroom" and is an edible mushroom native to East Asia. The name shiitake translates to tree (shi) mushroom (take). Cultivated from at least 1209 the shiitake plays an important role not only Asian cuisines but also in traditional medicine. Shiitake mushrooms are garnering growing support from health enthusiasts who are purport their many beneficial attributes. Superstar mushrooms should never be used instead of modern medicine. Powdered raw dried fruiting body. Allergy advice: It is always a good idea to try new foods in small amounts to ensure that it right for you. Some mushrooms can produce allergic reactions, so we suggest that you don’t consume too much the first time you try them. 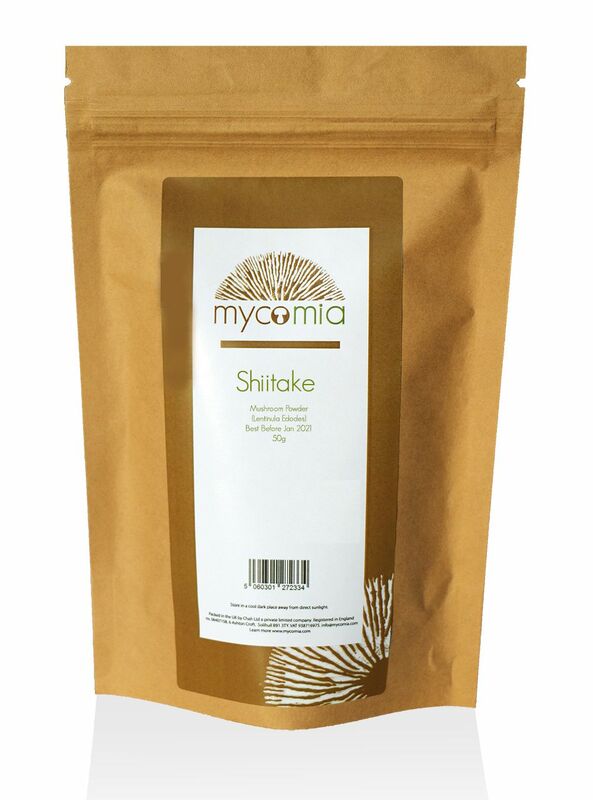 Our mushroom powders can be mixed in a superfood smoothie, juices, made into a tea or sprinkled into food. Mushrooms are around 92% water so dried powdered mushrooms will go a long way. Suggested dosage range is 1-2g per day. 1 teaspoon equals 1.5 grams.